Randy is here again today to talk about one of his new favorite dishes, this BLT Macaroni Salad Recipe that I regularly make for picnics and potlucks. 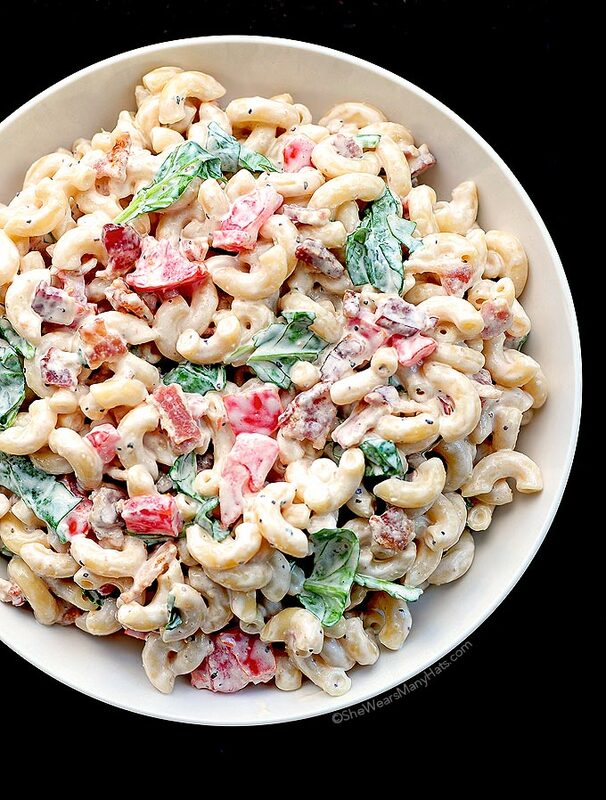 There are a few macaroni salad recipes we like, but when bacon, baby spinach, and tomatoes get together with pasta something special happens. I’ll let Randy tell you more about it. Take it away Randy! When I think of macaroni salad I think of eating outdoors. I normally enjoy macaroni salad at picnics or tailgate parties or church luncheons. It’s easy to make a lot of it at one time, it goes with many different main dishes, it travels well and it’s so familiar that even picky eaters will scarf it down. What’s more, if you make extra, macaroni salad makes for great leftovers right out of the fridge. 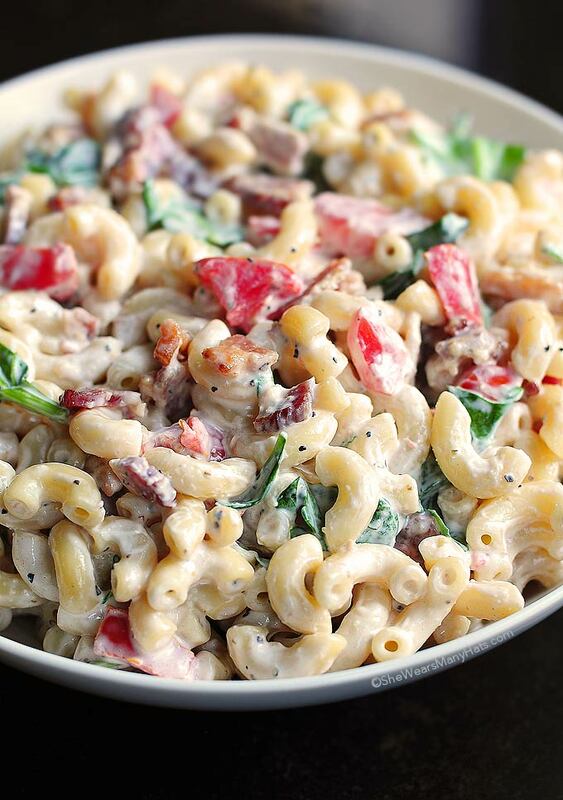 This BLT Macaroni Salad Recipe is everything that’s great about mac salad and more. It’s satisfying but not too rich and it can be a meal in itself. The vegetables are pretty in there but they aren’t just for show. The tomatoes and the greens just taste great together and they are the perfect compliment to the crispy bacon. There’s a reason BLT sandwiches are so popular. I am not always the most polite person around large outdoor spreads of food. That’s because outdoor food spreads involve fried chicken and there’s almost never enough fried chicken to go around. I do what it takes to make sure I get some prime fried chicken pieces. Sometimes I begin conversations with the person who is closest to the chicken platter right before the dinner bell rings just to claim the best real estate. Or, before the meal when no one is looking I conceal one of the chicken plates with a dishtowel. One time I brought a casserole lid from home labeled ‘pickled sardines’ that I used to cover the best looking fried chicken plate. 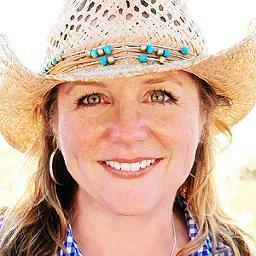 The best thing about Amy’s BLT Macaroni Salad Recipe is I don’t need to bully my way to the chicken to eat well. If I get boxed out and all the legs and wings are gone before I get there I can still eat something delicious and satisfying. And I can look down my nose at those fried chicken bullies. Thanks, Randy! Lesson of the day: Don’t get between Randy and the fried chicken unless you have a batch of BLT Macaroni Salad as a backup. Enjoy! 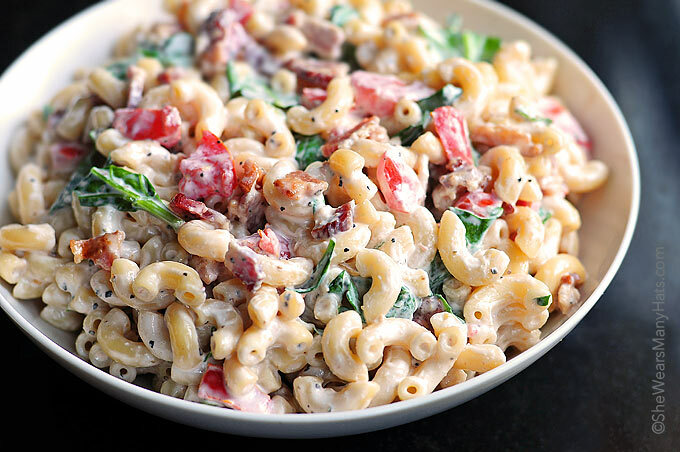 A tasty macaroni salad with all the flavors of a BLT. Oh yeah, I’m going to need you to send me a big bowl of that right away!!! YUM! BLT is my favorite sandwich. 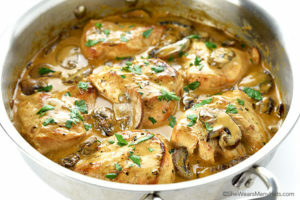 I’ve seen recipes for this, but haven’t found one that I like. I’ll have to give this a try. I am not an outdoorsy person but I can totally go for this salad! Gorgeous! 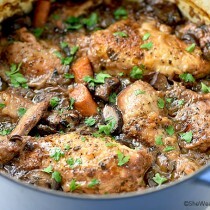 I’m new to this site …….Can someone please tell me how to save this recipe ??? This really looks wonderful. I can’t wait to give it a try. just wanted to say Thanks for not saying —DUH it’s right there ! I meant to say you are NOT nuts. Fixed the prior message. I need more coffee. 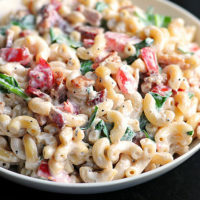 I love macaroni salad and bacon pretty much makes everything better, so this is definitely going on our must-make list! I’m unable to find “rice wine vinegar” anywhere. I can find regular rice vinegar and also some flavored rice vinegar but no rice wine vinegar. What is a good substitute… Red Wine Vinegar or just plain Rice Vinegar???? I’d really like to try this recipe over the weekend. Rice Vinegar is correct. I’m not sure why I put rice wine vinegar. Whoops! Sorry about that. Had anyone tried this with white, apple cider or red wine vinegar? I have all those in my pantry and not rice vinegar! ???? A little late, but yes. I used apple cider vinegar and some Truvia. I also cut the pasta WAY back to 1 1/4 cups dry pasta for the two of us and kept the bacon the same, tomatoes, lettuce/spinach. I had to play around with the dressing.. Deelish. Found this recipe on pinterest. I made it yesterday for a potluck at work, and it was a huge hit! And so easy. Also really easy to adapt to gluten-free for my celiac coworkers, just buy gluten-free macaroni and make sure your mayo is gluten-free. So glad to hear it. And thanks for the gluten-free tip! I’m not real big on bacon ~ love it but don’t like the mess of coking it. I substitute a small can of Hormel ham for the bacon and add frozen English peas instead of spinach leaves. I put the peas in the colander and then drain the pasta over them. This thaws them and give just a touch of sweetness to the salad. Can regular vinegar be substituted for the rice vinegar? Yes, it can. I hope you enjoy it! Yes it can. It may be better to add the tomatoes just before serving as they will get a little mushy, but otherwise this salad is better if made a day ahead. I hope you enjoy it, Phyllis. I have made something similar. I use ranch dressing both dry and bottled. I also omit the tomatoes for shredded carrots, green onion, green pepper. It is my new favorite! This looks amazing! Is there anything I can substitute the mayo with? I make this quite often with a couple changes. I do use lettuce rather than spinach. I also do not seed the tomatoes. For the dressing, I use Miracle whip and thin it down with some milk and add sugar (to taste). Everyone just loves it and very rarely is there any left over. I made this but added diced onions and diced sharp cheddar cheese. I cut some of the fat and calories by using fat free sour cream and turkey bacon. 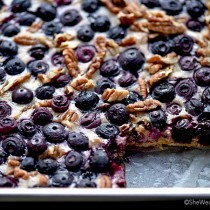 It is so good I will be making this again. I was wondering instead of sour cream can I sub Greek yogart? Yes you can! Greek yogurt will work just as well. made this today and it is sooooo awesome !!! thanks so much for sharing ! Happy to hear that you enjoyed it, Deneen! Made this for a potluck at work tomorrow but I just “sampled” it and ‘fraid it might not make it until tomorrow. Really tasty! May just have to add some extra greens and tomatoes to make up for the taste(s) I snuck! Thanks for the recipe! I too do not eat bacon. However I immediately thought of picking up a little barbeque chicken. barbeque for the added flavor. The Turkey bacon sounds good as well. I make this too. 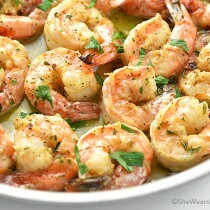 Often leaving out the bacon,,sour cream and spinach, adding capers and salad shrimp. Use malted vinegar in place of rice vinegar. Any white vinegar will work well, Gloria. 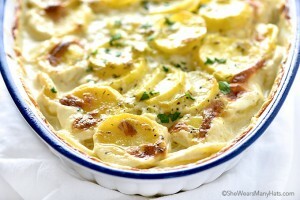 I just made this for work tomorrow and had to sample it – SO yummy! I doubled the batch! Thanks for an easy and tasty recipe. I think everyone is gonna love it. My guest and I thought it was very bland. Any suggestions what can I add to give it more flavor? Just made this BLT Mac salad. It is very good. Waiting for reviews from the rest of the family. Just one observation: for me, its a tad too much black pepper. I will try alittle less next time. Please give this a try. You will not be disappointed!!! Update: Served this with dinner last night. Other family members tried it for the first time and really liked this salad! Thank you for sharing this recipe! So happy to hear that you enjoyed it and you were able to make substitutions successfully. I made this today and was so looking forward to it, but the pepper made it way to spicy. Next time I will only add 1/2 teaspoon. this salad look very good. But did you know that because the pasta is serve cold that the resistant starch in the pasta will make it pass though the stomach without making your blood sugar high like it does when you eat hot cooked pasta, check it out and see that a lot a things that have a high starch or carb count can be eaten cold when you cook it and let it get cold or room temp, help with keeping high blood sugar down for people with diabetes , the starch can’t be digested when it is cold, and if you do reheat it, it still will pass with a much lower starch count. Check it out on google for Resistant Starch. this looks great. i would like to make it fir thanksgiving party, so can you please tell me how much of the ingredients to use for about 20 to 25 people. thank you cheryl. I made this per the recipe, but it was kind of blah. I used fresh baby kale and miracle whip and sour cream, didn’t like it with miracle whip. Next time I will also try small dice of half a medium red onion to give it some zip and I will try caines mayo. Loved fresh tomatoes and I used roma. I also used turkey bacon which again did not fit right with recipe. Next time I will use regular bacon. Just made this for a Christmas potluck. Used sundried tomatos instead of fresh and also added grated sharp cheddar. Just tasted before putting in the fridge and Boy! It is yummy! Finally I used Canadian back bacon which is our favorite. Cannot wait to share tonight. Doubled the recipe so I had an extra bowl for the family tomorrow. Those substitutions and additions sound delicious, Susan! A teaspoon and a half of pepper was TOO much for my family. Too much spice! I’d recommend lowering it to a 1/2 teaspoon to 1 teaspoon max. Holy Cow!!! I made this last night to have for dinner and OMG!!!! I didn’t have Rice Vinegar so I omitted it and used gluten free noodles and I must say, when I tasted it I had to look back at the bowl to make sure it was what I had just made! Best BLT pasta salad I have EVER tried. I even wrote in my food journal about it lol! Thank you for sharing!!!! 🙂 So happy to hear that, Jaylyn. Glad you enjoyed it! How much bacon? I did not see that in the ingredients. I made this yesterday and my husband as declared it his new favorite pasta salad. I follow the recipe exactly……almost…..I may have added an extra handful of bacon 🙂 I will definitely be making this allot this summer!!! 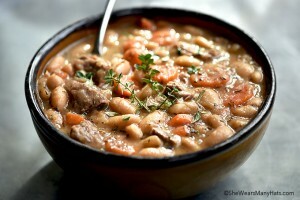 Thank you Christy Jordan for sharing this recipe! Now I have another good cook to follow! We can’t have dairy, would it effect the overall taste if one just left out the sour cream? I think it will still taste good, Jessie! Add a bit more mayo and adjust seasoning to taste. Love this salad! Since it’s just the two of us right now, I used 2 cups mini pene because that’s what I had, and do a taste and see with the dressing. I also made some croutons to sprinkle on top. I will definitly be making this again. I made oven fried chicken legs to go with it. Best pasta salad ever! I used bow tie pasta instead. It was the hit of our picnic! Great to hear it, Cheryl! Bow tie pasta is one of my favorites. If you fry your bacon first and use the grease in the water you boil the pasta it really tastes yummy!